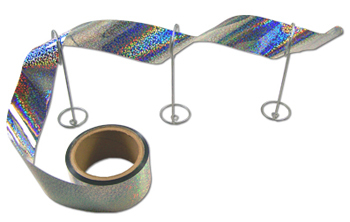 Irritape is a holographic foil bird repelling flash tape. It uses visual and audible signals to scare birds, preventing them from roosting in the area. Irritape is a bird repellent device that has many names: foil tape, flash tape, bird tape, mirror tape, repeller ribbon, mylar tap, holographic tape, to name a few. Flash tape works so well because of its unique 3 method action that utilizes sight, sound, and physical barrier. Visually the light reflected is seen as a three dimensional ripple effect that disorients birds senses. Additionally the holographic patern's interlocking circles mimics that of an owl which is natural predator of many avian pests. In regards to audible signals the flapping metallic sounds produced by the tape flapping in even the slightest breeze serve to create an unsettling and uncomfortable environment for birds to remain in, while being negligible to human senses. 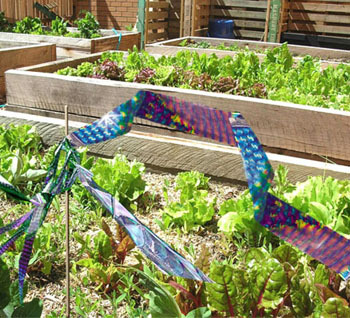 Finally, the tape acts as a physical barrier when installed linearly on roosting surfaces, making access to landing zones unattractive to pigeons and other pest birds. Bird repellent flash tape is well suited to use in agricultural environments. Many grape vineyards use holographic tape protecting their rows during the harvest season. By applying Irritape to trees with loose ends that flap in the wind birds will be frightened from a distance making them avoid the area all together.